3D Mammography is a new technology that offers many benefits over traditional mammography. 3D mammography, or breast tomosynthesis, is a relatively new breast imaging procedure approved by the U.S. Food and Drug Administration in 2011. 3D captures multiple slices of the breast, all at different angles. The images are brought together to create crystal clear 3D reconstruction of the breast. The radiologist is then able to review reconstruction, one slide at a time, almost like turning pages in a book. This makes it easier for doctors to see if there’s anything to be concerned about. Traditional mammography produces just two images of each breast, a side-to-side view and a top-to-bottom view. 3D mammography produces many X-ray images of the breasts from multiple angles to create a digital 3-dimensional rendering of internal breast tissue. This allows radiologists to view the breast in 1-millimeter ‘slices’ rather than just the full thickness from the top and from the side. 3D mammography can be used for routine screening mammography and may be particularly effective for women with dense breast tissue or those at high risk for developing breast cancer. Research suggests that radiologists are able to more accurately interpret results from 3D mammography in dense breast tissue, which can lead to fewer false-positive and false-negative readings. Women should prepare for a 3D mammography in the same way they would prepare for traditional mammography. Women should consider scheduling mammography for a date one week after their period begins, as just after menstruation a woman’s breasts will be the least tender. 3D mammography requires a bare torso, so wearing comfortable, easy-to-remove clothing is recommended. Deodorant, perfume, lotion and other products should not be applied to the underarm or torso before 3D mammography because they can interfere with the imaging process. Women should inform their physician if they are pregnant, breastfeeding, have breast implants or suffer from any medical conditions. Results from a landmark study evaluating close to half a million mammography exams published in the Journal of the American Medical Association (JAMA). Graphic courtesy of Hologic. 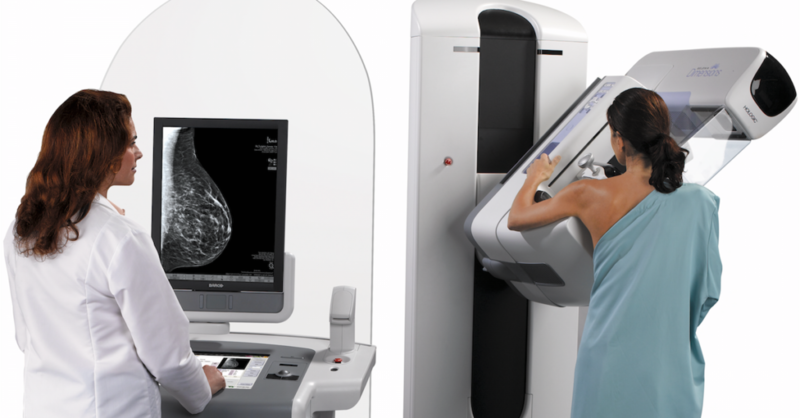 The 3D mammography procedure resembles that of traditional mammography. The procedure takes place in a private room and is conducted by a radiologic technologist. The woman undergoing 3D mammography is required to remove any clothing above the waist, as well as any jewelry or other objects that might interfere with the imaging process. During the procedure, the woman is positioned before a 3D mammography machine and her breasts are held in place by two compression plates. The pressure placed on the breasts by the compression plates can cause discomfort but only lasts for a few seconds. When ready, the radiologic technologist will start the 3D mammography machine and a robotic arm will move in an arc over the woman’s breasts as multiple X-ray images are taken. The dose is similar to film mammography and is only slightly higher than in standard 2D digital mammography. The scan itself takes less than two to three seconds per view. The entire procedure takes approximately 10 to 20 minutes. A radiologist will interpret the results of 3D mammography, looking for signs of calcification or masses in the breast tissue, and report findings according to a standardized classification system known as Breast Imaging Reporting and Data System (BI-RADS). A woman and/or her primary care physician will be notified if her 3D mammography reveals that she has dense breasts or an abnormality in her breast tissue. If an abnormality is detected, a Breastlink radiologist will likely recommend additional imaging procedures to help provide women with greater clarity and determine the cause of any true abnormality. Schedule Your 3D Mammogram with Breastlink. We pair state-of-the-art 3D mammography equipment with an unmatched team of breast radiologist specialists and technologists to ensure you benefit from the best breast screening available. Contact us online and we will get back to you within one business day to schedule your appointment.